An initiative by Google to launch movie rentals through its YouTube service will reportedly arrive without the catalogs of some of the movie industry's most prominent studios, who are infuriated that the search giant continues to allow users to access video piracy sites through its search results. According to a report by The Wrap, both Fox and Paramount have confirmed an intention to "not move forward with any deal at this time," while Disney has not signed on and is but is thought to be similarly opposed. Warner Bros., Sony and Universal have already signed deals to participate in the new YouTube rental service, viewing its potential 130 million monthly users as a "massive new potential audience for renting movies," according to the report. "Its unproven as to whether this audience through this medium will pay for content," the report cited an unnamed Sony executive as saying, "But its a huge audience. And its an audience that pays for video." The holdout studios are upset that Google has "not taken adequate steps to stop supporting piracy sites," and reportedly one executive has specifically warned Google that it "needs to stop supporting pirate sites by linking them in searches and advertising on them." Google hopes to convert its YouTube operations, acquired in late 2006 for $1.65 billion, from an expensive experiment into a more profitable enterprise. The company recently shuttered its own home-grown Google Video, converting its remaining material to YouTube. Google began serving ad-supported films and TV episodes from MGM, Lions Gate and CBS in 2009, and launched a "beta" movie rentals program earlier this year, open to a variety of publishers who want to monetize videos via variable on-demand pricing. 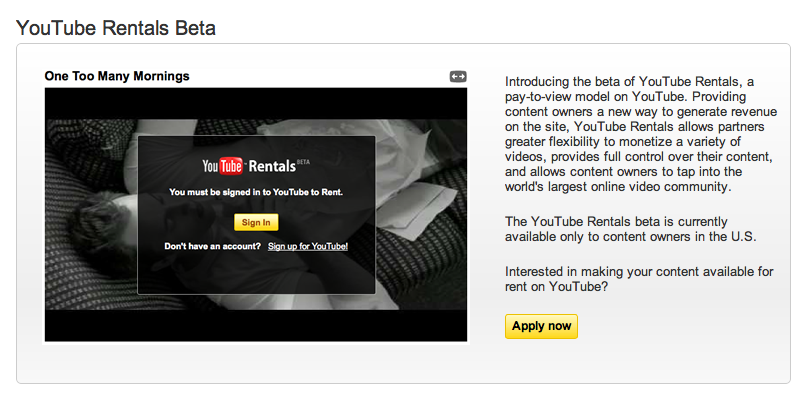 The launch of YouTube's commercial movie rentals program is now hanging on obtaining deals with all the major labels. In contrast, Apple launched its TV business and subsequently its movie downloads with just a few initial launch partners, largely centered upon its close partnership with Disney. It has since signed up all the major TV and movie studios, although it has shown less interest in supporting the work of indie filmmakers. Google's major competitors include Apple's iTunes, which both sells downloads and rents streaming downloads of commercial movies and TV shows but does not rent non-commercial videos (providing only free access to podcasts and iTunes U content); Amazon, which streams rentals of 5,000 commercial movies and TV shows via a web browser; and Netflix, which streams subscription content of a wide selection of devices, including game consoles, iOS devices and other dedicated appliances in addition to web browsers.